We looked down from 118 nautical miles on Space Radar Lab 1 and were wowed by this ecological playground. The volcanic landscape, mottled by the dark streaks and flows of basaltic lavas erupted from these shield volcanoes, is always a striking sight. North is toward the upper right, Isla Isabella is the seahorse-shaped large island at center, flanked by Isla Fernandina on the left and Isla Santiago on the center right. At lower right is Isla Santa Cruz, with the small Isla Floreana at bottom center. We saw no volcanic activity, but the islands were a major target for radar mapping of the islands’ successive lava flows, using roughness measurements to gauge the relative age of previous eruptions. That sequence can tell us how active the islands have been before historical times, and give us a sense of when a future eruption might be expected. NASA has noted that “the Galapagos Islands, which are part of Ecuador, sit in the Pacific Ocean about 1000 km (620 miles) west of South America. 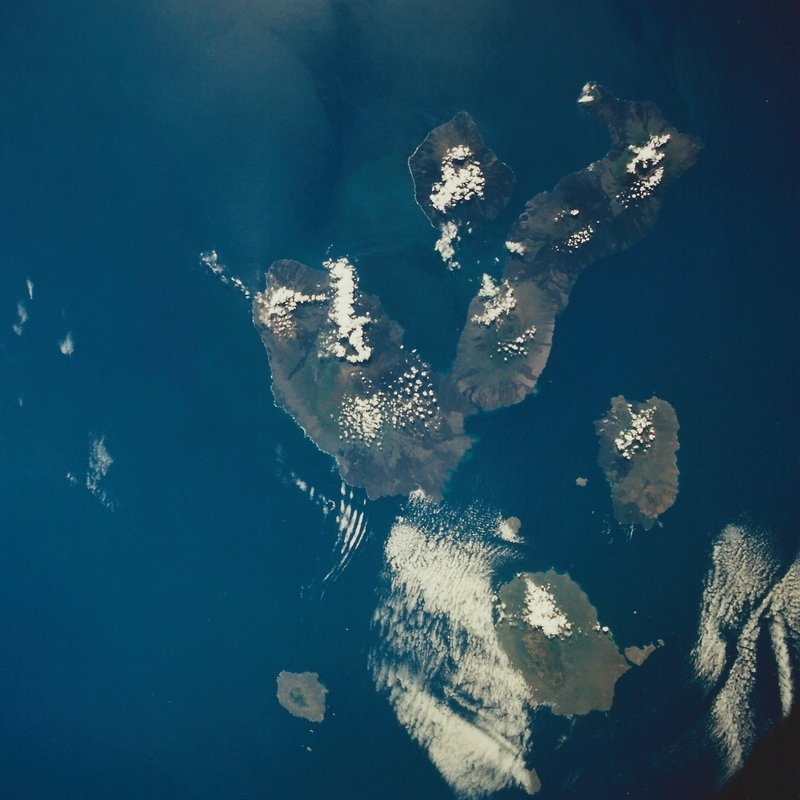 As the three craters on the largest island (Isabela Island) suggest, the archipelago was created by volcanic eruptions, which took place millions of years ago. The western Galapagos Islands have six active volcanoes similar to the volcanoes found in Hawaii. Since the time of Charles Darwin’s visit to the area in 1835, there have been over 60 recorded eruptions of these volcanoes. I’ve not made it to the Galapagos–yet. But this evolutionary case study is high on my list of future vacation spots. Read more about the view from orbit in “Seeing Space,” a chapter in my new book, Ask the Astronaut.